an affective modality for critical aesthetics in the Anthropocene. Louise Boscacci 2011–2013, ‘A Souvenir of Sunny Zincland (Shadows Trace Project)’. Vintage folding postcard, aerial digital photographs, dimensions variable. Louise Boscacci 2011–2016, ‘Shadows Trace to Shadow Mappings, Part II’. Digital image. 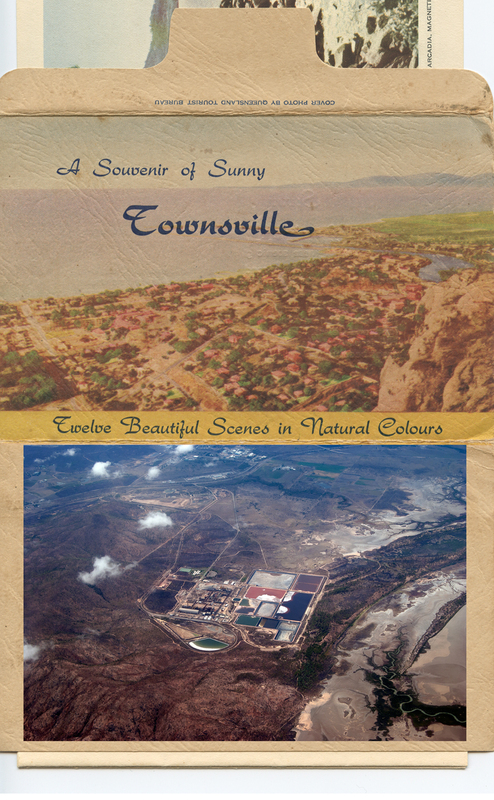 “This project is a continuing trace of finding, naming, visualising, mapping, and sounding 122 shadow places of the tropical port place of Townsville, Australia. The research trace began in 2011. A once invisible and unknown network of material-capital interconnections, mineral mobilities and ecological interrelatedness is disclosed and described. New embodied stories are emerging” (Boscacci 2016). The Sixth Biennial Conference of the Association for the Study of Literature, Environment & Culture, Australia & New Zealand (ASLEC-ANZ) in collaboration with the Sydney Environment Institute (SEI). University of Sydney, 23 – 25 November 2016.